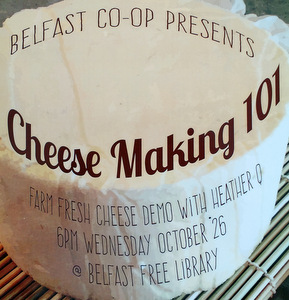 The Belfast Coop will be presenting a Farm Fresh Cheese Demo with Heather Q at 6pm Wednesday, October 26th held at the Belfast Free Library. This is a FREE event, and you can sign-up in advance at the registers at the Belfast Coop, or walk-in without registering as long as there is still space available. Posted in Events, Learning, News.